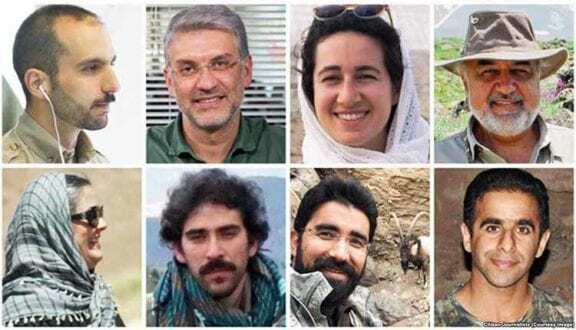 iran-hrm – Five out of the eight Iranian environmentalists who were arrested in January 2018, have been issued preliminary indictments. Those who have not yet been charged are Amir Hossein Khaleghi, Abdolreza Kouhpayeh and Sam Rajabi. In an interview with the state-run ISNA news agency, attorney Mohammad Hossein Aghasi who represent a number of the detained activists confirmed the news. The environmentalists were arrested on January 24 and 25, 2018, by the Islamic Revolutionary Guard Corps’ (IRGC) Intelligence Organization. They have not been given access to lawyers of their choice or have had a trial date set. Family members said on social media late in September that they were told by judicial authorities that the detained environmentalists can only be represented by lawyers from a pre-approved list of 20 that the judiciary had published in June. Detainees charged with various offenses, including national or international security crimes, political, and media crimes, are subject to Article 48 of Iran’s 2014 criminal procedure law, which says that they must select their counsel from a pre-approved pool selected by Iran’s judiciary during the investigation. The list of lawyers allowed to represent people charged with national security crimes in Tehran province was published in June, and does not include any women or human rights lawyers. The Revolutionary Guards arrested the environmentalists, who are all members of a local environmental group, the Persian Wildlife Heritage Foundation, on January 24th and 25th. Abbas Jafaridolatabadi, the Tehran prosecutor, told reporters on February 13th that detained activists are accused of using environmental projects as a cover to collect classified strategic information. However, the Foundation claims to only work to conserve and protect the flora and fauna in Iran. The family of Seyed Emami, an Iranian-Canadian university professor, reported that he had died in detention under unknown circumstances on February 10th. According to Iranian authorities, he committed suicide, but they have not conducted an impartial investigation into his death, and have placed a travel ban on his wife, Maryam Mombeini. The Persian-language Etemed newspaper reported that authorities had arrested four other environmental activists on February 25th. Among them was Abdolreza Kouhpayeh, another member of the wildlife heritage group. Although he remains in detention, the other three detainees were released from prison. In a tweet on May 9th, Mojgan Jamshidi, a journalist who covers environmental issues, said that authorities had arrested more than 40 local environmental activists in the city of Bander-e-Lengeh, in Hormozgan province in southern Iran. Human Rights Watch has confirmed that all 40 were later released. ISNA News Agency reported on May 22nd, that Issa Kalantari, head of Iran’s Environmental Institution, said during a speech at a bio-diversity conference that the government had formed a committee consisting of the ministers of intelligence, interior, and justice and the president’s legal deputy. The committee concluded that there is no evidence to suggest the environmentalists are spies. In fact, the committee said the environmentalists should be released. One of the families’ lawyers told the Center for Human Rights in Iran on October 8 that authorities have issued five indictments, one being the “corruption on earth”, a serious charge that includes the risk of execution. He said that he believes that the authorities are attempting to scare the families into choosing lawyers from the approved list. Iran is required to ensure that anyone facing criminal charges has access to a lawyer of their choosing under the International Covenant on Civil and Political Rights. As well, after arrest, the detainee must be promptly informed of their charges, and detention before trial is uncommon. Detainees are entitled to a timely trial, or release. “Any person, who extensively commits a felony against people’s physical safety, offenses against internal or international security of the state, spreading lies, disruption of the economic system of the state, arson and destruction of properties” can be considered among the “corrupt on earth” under article 286 of Iran’s penal code. They can then be sentenced to death if the court finds “the intention to cause extensive disruption in the public order, or creating insecurity, or causing vast damage or spreading corruption and prostitution in a large scale, or the knowledge of effectiveness of the acts committed.” Otherwise, the sentence may be between six months and five years.